Beautiful turquoise ring with moissanite accents set in sterling silver by Hileman Silver Jewelry. This man's turquoise ring is inlaid with birdseye turquoise from Kingman Arizona. The turquoise is a nice blue base color with a very slight darker blue veining. The turquoise inlay sections are separated by thin silver dividers. 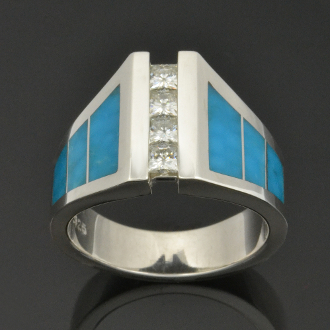 There are 3 pieces of blue turquoise inlaid on each side of the ring. The four princess cut Moissanites total .64 carats and are channel set down the center of the ring. The ring is 15mm wide at the top and tapers down to about 6mm at the bottom. It is available in sizes 8 to 11 by special order in 3 to 6 weeks. Sizes larger than 11 will be a small additional charge. Other inlay stones and colors are also available. *We recommend upgrading to Continuum sterling silver for added durability and tarnish resistance if you are choosing this ring as a wedding ring or everyday wear ring.